May is Preservation Month, when we celebrate places that matter to us and what makes them meaningful. Particular attention is paid to preservation of historic architecture, an ongoing endeavor throughout St. Louis and specifically in Dutchtown. Whether you’re just patching the roof of your old two-family, keeping your bungalow looking tidy, or gut-rehabbing a massive old building, your neighbors appreciate your commitment to preserving the built environment that makes Dutchtown special. In honor of Preservation Month, we’re going to take a look at some previous preservation efforts in Dutchtown. Every year, the Landmarks Association of St. Louis bestows their Most Enhanced Places Awards to outstanding rehabilitation projects, notable additions to historic buildings, and/or new buildings that respect their historic context. Dutchtown has had several Most Enhanced Award recipients over the years. Let’s take a look back at some of our winners. This mixed-use building with storefronts below and apartments above was a recipient of the Most Enhanced Award in 2017. The rehabbed building features restored pressed metal ceilings and woodwork. Dutchtown’s own Anthony Duncan was the architect on the project. You can get a peek inside this building at DT2’s After Hours with Pop-Up Professionals on June 20th. This three-story building at Cherokee and Nebraska received the Most Enhanced Award in 2016. The building features a fantastic cast iron store front. 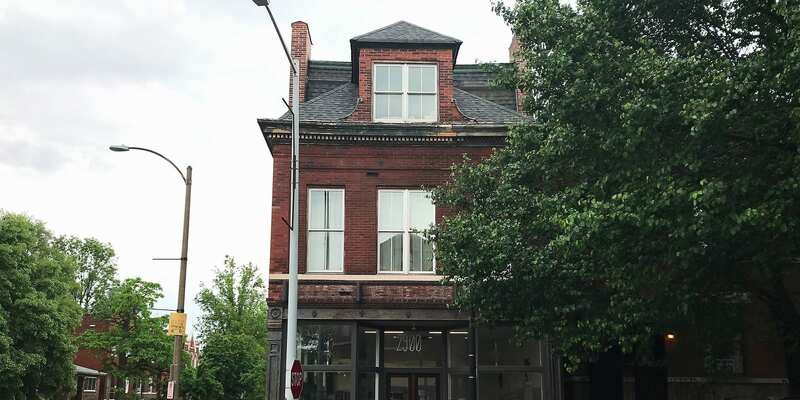 Twenty years of vacancy made this one of the more challenging projects on Cherokee Street, but Cherokee Street developer Will Liebermann breathed new life into this important piece of Cherokee’s fabric. The Fox Manor Apartments project was an unlikely candidate for an award usually bestowed upon buildings with a bit more storied history behind them. The mid-century low-rise apartments near St. Mary’s High School were long a trouble spot and an eyesore. But in 2014, Landmarks chose Fox Manor due to its benefits to the surrounding historic neighborhoods by improving aesthetics, safety, property values, and functionality. 2608-2610 Cherokee received the Most Enhanced Award in 2011 after surviving over fifteen years of vacancy and unfortunate mid-century alterations to its historic storefronts. Cherokee Street architect Peter Hammond used clues from an old photograph to piece together the brick, stone, and cast iron facade as it originally appeared. Keep on preserving, Dutchtown! There’s still a project or two around the neighborhood. Maybe you can be the next Most Enhanced Award winner! Read more news about Architecture, Cherokee Street, Dutchtown, Photography, and Preservation.